Take the 940 WINZ Trivia Challenge! 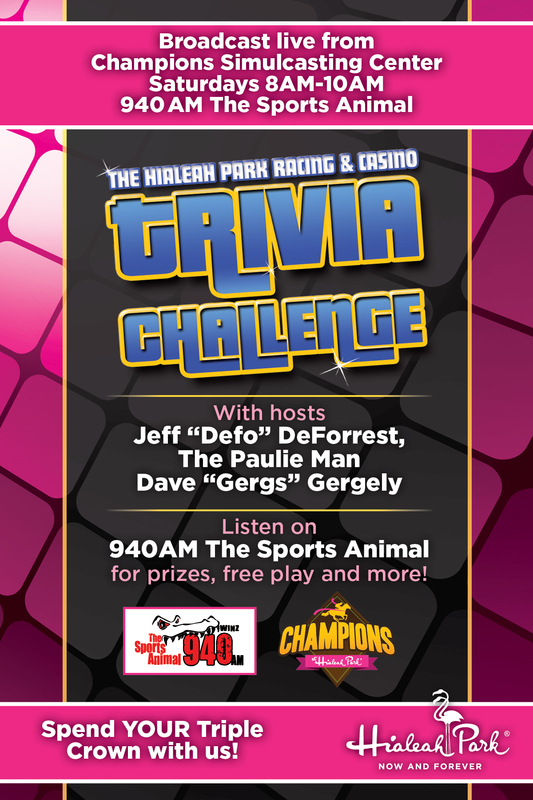 Hialeah, FL – April 27, 2018 – Hialeah Park Racing & Casino is helping horse racing fans get ready for the upcoming Triple Crown by partnering with WINZ 940 AM and broadcasting the popular Trivia Challenge featuring host is Jeff “Defo” DeForrest live from the world-famous venue’s Champions Simulcast Center & Sports Bar from 8 to 10 a.m. each Saturday through June 9. The show can be heard online at 940winz.iheart.com. The show has been on the air for more 20 years and is very popular among sports fans, and also features co-host Paul “The Paulie Man” Messel, who is not only WINZ’s sports director, but a knowledgeable sports guru and is widely regarded as one of the best thoroughbred handicappers in all of racing, and co-host Dave “Gergels” Gergely, a three-sports star from Allentown, PA and long-time local area charity fundraiser. Fans interested in expert handicap advice are welcome to call the show at 866-801-0940. The Triple Crown kicks off with the Kentucky Derby on Saturday, May 5, followed by the Preakness Stakes on Saturday, May 19, and concludes with the Belmont Stakes on Saturday, June 9. Race fans can watch and wager on all the action at Champions Simulcast Center. For more information, call 305.885.8000 or visit HialeahPark.com. Hialeah Park began making history in 1922 as the Miami Kennel Club, the first pari-mutuel greyhound track in America, founded by Missouri cattleman James Bright and aviation pioneer Glenn Curtiss. In early 1925, the newly renamed Hialeah Park opened for thoroughbred racing over a one-mile dirt track. Today Hialeah Park is home to a state-of-the-art casino, which began operations in August of 2013. It features 800 Las Vegas-style slot machines, electronic roulette and blackjack, South Florida’s most popular poker room, several restaurants and cocktail lounges, and seasonal quarter horse racing. Champions Simulcast Center and Sports Bar, on the second floor of the iconic Clubhouse, is open year-round, offering bettors world-class horse racing action from across the United States. Newly redesigned space is available for weddings, quinces, and special events. The park’s vast outdoor space is also available for events. An official corporate partner of the University of Miami, Hialeah Park is listed as an Audubon Bird Sanctuary and is recorded in the National Register of Historic Places. With entrances at 100 East 32nd Street and 2200 East 4th Avenue, HialeahPark is easily accessible from all major Miami highways. The landmark venue is conveniently located just minutes by car from Miami International Airport, South Beach, Downtown Miami, Coral Gables, and Doral. This entry was posted in Blog and tagged hialeah park, horse racing, simulcasting. Bookmark the permalink.